I'm uncertain of what to call this thread. I was always curious about two guys and their influence when it came to Momoclo. One of course is Kawikame(Hope I spelled it correctly), their chubby manager. I know next to nothing about this guy, except he likes geeky things and wrestling? The other one I do not really know the name of. I think he is sometimes referred to as Yama-Chan? 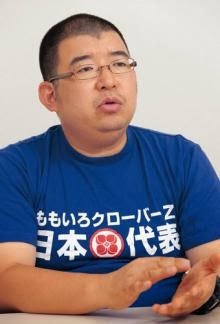 He was the fans representative in Momoclo Vs. Arashi and he was the host of Momoclo vs. Zombies. He usually wear small round glasses and a bowl like haircut, if it rings any bell? As far as I think i know he got some connection to other idol groups, like AKB48 and I also saw him in a short spot with Yui & Moa from Sakura Gakuin/Babymetal. But since I read no japaneese I have not been able to find out much. So if anyone know anything and can find the time to answer with knowledge of any of these two gentlemen, I would be very grateful. Maybe you should read a few more posts before starting a thread like this. Yamasato Ryouta is a comedian. KWKM or Kawakami Akira-Manager and Sasaki Atsunor the producer/ director. There are some other people like Stardust Agency boss or the new "Evil Line" brand but the KWKM and Sasaki producer are the most popular, influential and helps the most in bringing MCZ to it's popularity now. KWKM is the their manager, the one who manned and suggest (not clear on this) this whole idol thing when StarDust Agency start their Idol Units. He basically the caretaker of the girls from the start of MCZ until now and probably until MCZ ends. Like wrestling a lot and host his own radio shows with occasional MCZ appearance in the show. Sasaki Atsunori take care and set their live performance , tv performance and their tv shows. Yeah, all the incredible live that MCZ did was his idea and works. Incredible and talented guy all around. It would be nice to have more info on people because this the only thing I know about them. I don't think Yamachan has anything to do with Momoclo, he's just one of the comedians who support Momoclo. Basicaly everything what @Maka has said. Probably if this thread is not restricted to men, will include more like Tomomin their other manager and Yumi sensei their choreographer. KWKM is basically the guy behind a lot of the ideas behind the themes of their singles. Examples would most obviously be "Chai Maxx" with the wrestling/boxing theme as well as "Z Densetsu" with the Super Sentai theme to it. There's also "Otome Sensou" with the shoulder guards being based off of Zaku II from Gundam but he admits that it's from a popular wrestling duo with spiked shoulder guards. And yes eyeless I should probably have called the thread "The People behind momoclo" so that it would have the female manager and other females like their coreagrapher in here. I'll see if I can change the title. Managed to change the title. ^I've read that too and was a little bit confused... maybe he is a bit upset because they are not chosing his songs anymore? He still writes for Ebichu so it's not a stardust problem and who could not love the momoclo girls so yeah, kwkm basically. I've never really liked the fact that Momoclo and Hyadain seem to have parted ways. They already had been using a lot of other producers even when Hyadain was still making songs for them, so it's not like him making songs limited what they could do. Also, he was more versatile than a lot of people seem to consider him - I doubt many people would have expected him to make Mugen no Ai judging from his Battle and Romance era stuff. Really, I think cutting him out of Momoclo's material only reduces the possibilities that they have. I'm still hoping that he will return someday. :-\"
Is the Hyadain situation speculation and/or rumor? I've read many comments...but none stating from official sources that they have parted ways. Being that he knocked out quite a bit of MCZ songs...it would be inconceivable to think that he is no longer part of the MCZ family. Perhaps something got lost in translation and it has mutated to something negative which contrasts why he is not writing. I don't need any more songs from Hyadain. The girls grew out of Coconuts. He had done a lot of great songs (for other groups, too). So it wouldn't be bad to have once in a while a new song for Momoclo, if it is something special. ^ Did Hyadain write all those? Damn. Those are all epic songs. They'd probably all be on my top ten. Momoclo wrote the lyrics for Ano Sora e Mukatte right? I've been listening to that on loop basically all day. My throat hurts from all the choking up. There's something amazing about that song. Something to do with the epic crowd at Panorama dai Jigokou @ Yoko Arena day 2 where they all did that chant before "yaaaay" as they were leaving the stage. Who came up with the melody for that song? I'm considering making it my ringtone (found an awesome music-box version on youtube). ^ Did Hyadain write all those? Yes, except he only supplied the melody for Mirai. Who came up with the melody for that song? 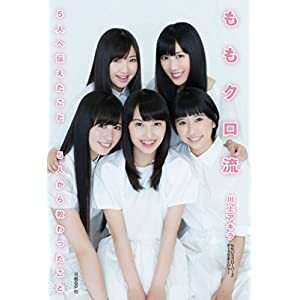 Kawakami-san recently released a book in which he explains his management philosophy and the things he taught (and learned from) each member of Momoclo.